When birding, as in life in general, it is important to stop occasionally and smell the metaphorical roses. This isn’t just because roses smell nice (although many do) or even because we need to remember that almost all birds depend in one way or another on plants (although they mostly do). We shouldn’t be looking at a flower just as a food source for a sunbird or hummingbird or whatever your local equivalent is, they are fascinating organisms in their own rights. Although some are perhaps more fascinating than others (as with birds I guess). 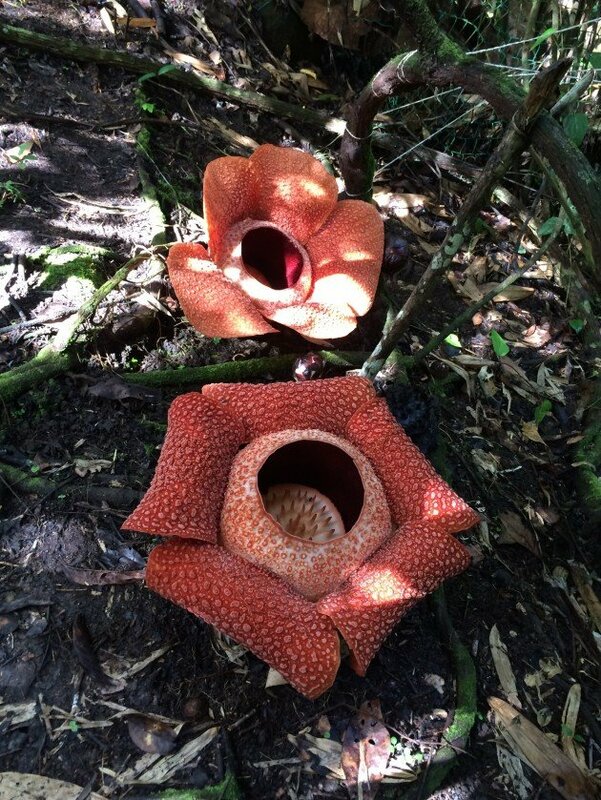 In the world of flowers, you aren’t going to get much more mega than the Rafflessia. 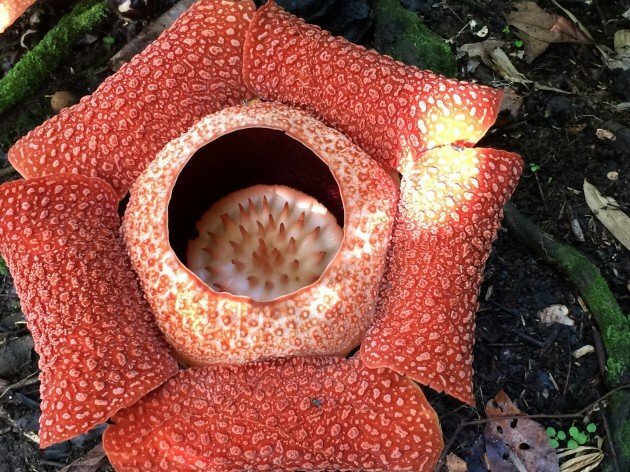 The 28 odd species of this genus are found in the Sunda (the islands of Indonesia, Malaysia and the southern bit of Thailand) and the Philippines, and are named for the inescapable (in this region anyway) Sir Thomas Stamford Raffles, he of the founding of Singapore fame. It is fitting that such an outlandish figure should give his name to such an outlandish plant. Not, I should add, a particularly big one. 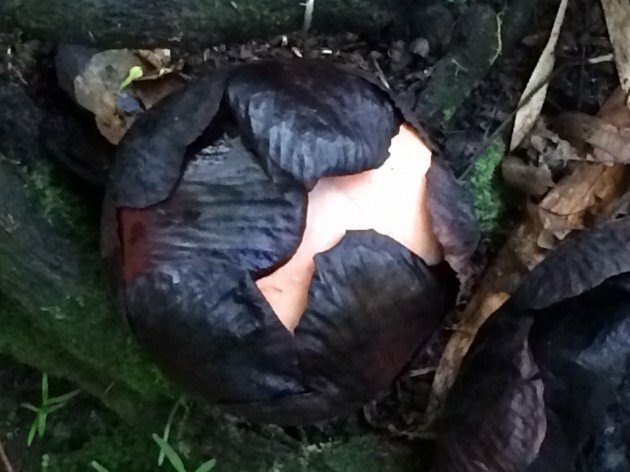 Quite the opposite, in fact, as the Rafflesia have no leaves, or roots, or even stems. In fact, pretty much all there is of them are the bodies hidden inside the stems of jungle vines of the genus Tetrastigma (relatives of the wine giving grapes, the products of which I am sampling now), and the flowers. The flowers which are, in contrast to the rest of the visible plant, quite large. Very large, even. 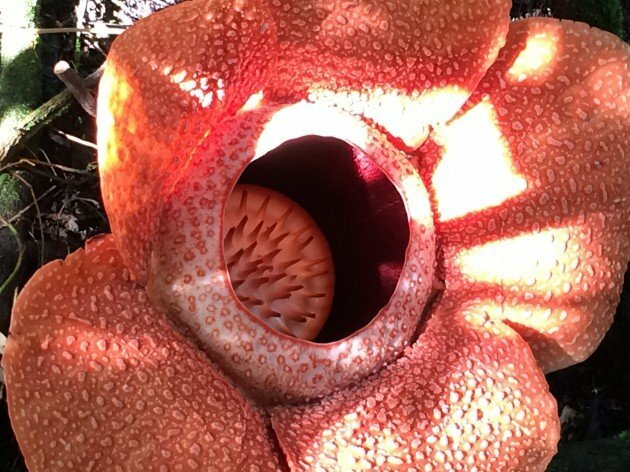 In fact, they are the largest flowers, by weight, of any plant, anywhere in the world. Not, the tedious part of me points out, the largest inflorescence, but the largest single flowers. 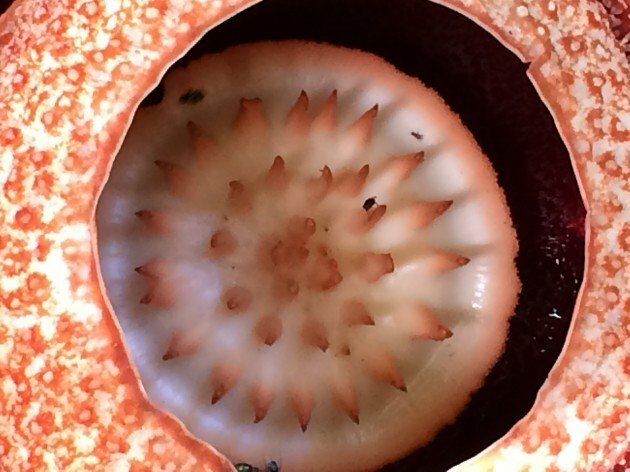 What Rafflesia lack in other qualities, they make up for in the size of their reproductive organs. 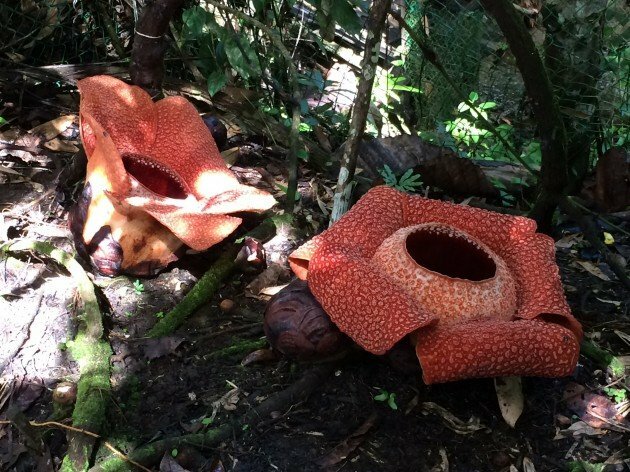 Rafflesia arnoldi has the largest flower of the genus, and by extension the largest flower of any plant. 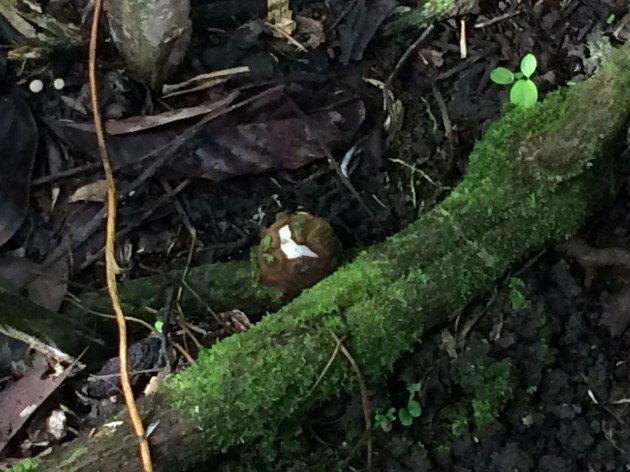 Found in Borneo and Sumatra, we managed to see some near Poring Hot Springs. Seeing a flower is quite a feat, since the average flower only lasts a few days and the species isn’t common any more. But fortunately it’s also something of a novelty, and its rarity has attracted attention, and this has led to the species being not only protected but as a tourist attraction. On a drive to the popular bathing spot of Poring Hot Springs you’ll see several banners advertising open flowers, with the number of days the flower has been out showing too. The trick to protecting this species has been tourism, which has raised awareness of its plight. 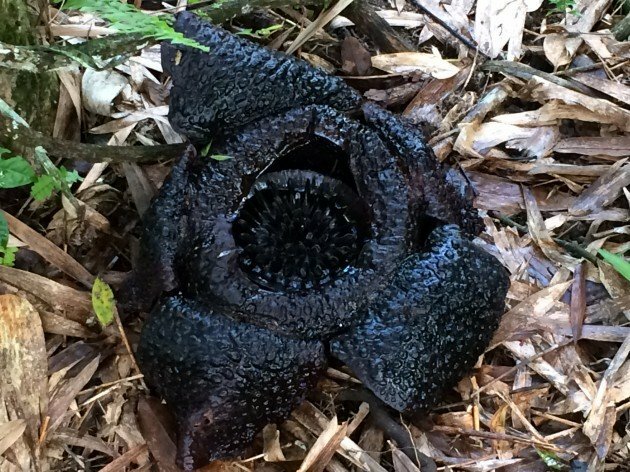 When conservationists first realized it might be threatened, they surveyed the local population and found that while people might be familiar with the long developing buds of these flowers (it takes months for the buds to develop into flowers), they had no idea that the buds developed into flowers. This was because as they walked past them they often knocked the buds off the vines, or, in many cases, kicked them off. This shouldn’t be read as a failing of the locals, it was essentially no different to walking along and kicking a can on the side of the road, or snapping off a twig to play with as you go. After all, there was no way of knowing that the buds were not part of the vines, and it didn’t seem to do the vines any harm (and actually, it did no harm to the vines). At any rate, once the locals knew what they were most landowners with examples protected the patches of forest they were in and joined with the conservationists in setting up the ecotourism project. They then get a little bigger! According to Wikipedia, they are known as corpse flowers, because of the nasty stench of decay. Thing is, they didn’t actually smell. Our guide told us it was a myth, albeit one with a lot of legs. And then, five days after flowering, it’s all over. Sure, they aren’t birds. But this isn’t a species you’ll see in a botanical garden. It is not a species that anyone, even the famous Kew Gardens, has been able to cultivate. So its future is dependent upon small patches of forest and the people that protect it. So if you’re birding in Borneo and you see a banner, drop by, do your bit to protect the species and its forest, and drink in one of the odder species that call this island home. Sometimes it is good to stop and smell the roses.